Romantic movies are always in season, but on those rainy afternoons in spring, I simply love grabbing one or two of my favorite romance movies, popping them into the dvd player, settling down under a warm blanket and letting the romance of their stories wash over me. As the rain drops are softly falling on the flower buds in my backyard, the awakening of love is unfolding on the screen. For just a little while, I am resting and allowing my heart to absorb the nurturing effects of a fabulous love story. Like the flowers, we all need those rainy days and the tender time of restoration they provide. Ibidii selected one of my own personal favorites to review when she wrote her article. The movie Persuasion is packed with those heart stopping moments of unobserved love and longing so clearly evident to the viewers in the faces of the characters, but carefully hidden from the view of the object of their desire. A love that stood the test of time, separation & persuasion. I have long been an admirer of Clint Eastwood. I even named my first dog after a character he dashingly played in an old western from my childhood days. However, until I read a review of The Bridges of Madison County written by Freshstart7, I had never seen this particular movie. Because of her recommendation, I watched and experienced my own shower of tears over this movie. Ironically, I found it too was the story of a love the stood the test of time, separation & persuasion. Some days seem to be made for romantic movies. There are some movies we know that we will love when we see the trailers, or even the cover of the dvd. But, there are others that are discovered because someone took the time to write a review, we separated ourselves from our daily schedules and were persuaded to encounter love. If you have a review you would like to share, please leave the link in our guestbook below. What You Can Review Today! How cool - I've never seen Persuasion. Now I have a new romantic movie on my list! That is one of the best values of featuring these reviews. The new things we all learn and get to see for ourselves. Oh, Susan! I love Persuasion!!! 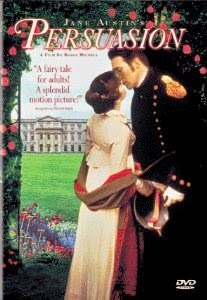 Perhaps I simply love the Jane Austen books, but the movies are always great too. Yes, I totally agree with you. I love the written reviews on Squidoo. I have found so much entertainment, not only in reading the reviews, but watching the movies reviewed. I was recently searching high and low for a copy of The Bridges of Madison County to rent. I've been wanting to publish a photo essay of those bridges and movie settings. Of course, the actual film will be central to the article. The bridges are a couple of hours from our Iowa home. Love your writing style in this post. Thank you Renaissance Woman! I look forward to reading your article. I actually rented that movie through Amazon and watched it on my computer. I rarely do that as I generally prefer the larger screen, but I actually found it relaxing yesterday. It is worth the time to watch. Like so many movies though, I do think having read the book and knowing the story beforehand, makes the movie more enjoyable. I loved The Bridges of Madison County! Of course, what's not to like about a film with Clint in it! This looks like a very interesting choice for a movie night? I haven't read the book or seen the movie, this is my first time coming across the title. Thank you for sharing - I will have to see about renting it. Oh, you definitely should Lesley! I know you won't be disappointed. Now that is truly a great sadness and lost opportunity! I fear I would have been a bit of a stalker over Clint Eastwood. Fun celebrities have that effect on me, but Clint was my first love.